Since the first launch of Dynamics 365 Portals in May 2016, it has come a long way adding a long list of capabilities in multiple releases—latest being 8.3 release which was launched in July 2017. As we have been cranking out multiple portal releases, it is important for you to understand Portal update process to prepare for any new Portal release properly and to reduce any impact on your customers. In this post, I will try to demystify whole Portal release as well as update process. First and foremost is to understand how frequent Portal releases are and what changes are expected in each. Usually rolled out in first two weeks of every month. However, sometimes these are not released depending on Major release schedules. Bugs logged by customers through Microsoft support. Proactive bug fixes for functionality. Sometimes, new features which are part of Portal Admin center. Major Follow the release schedule of Dynamics 365 releases. New functionalities in both Portal Admin center as well as core Portal Infrastructure. Dynamics 365 Portals main consist of two components described below. Each release can either have update available for both components or only Post website host. Solutions which are Installed in Dynamics 365 organization and contains the metadata entities for any Dynamics 365 Portal. Some of the functionality launched in any major version is dependent on Portal solutions being on latest version. 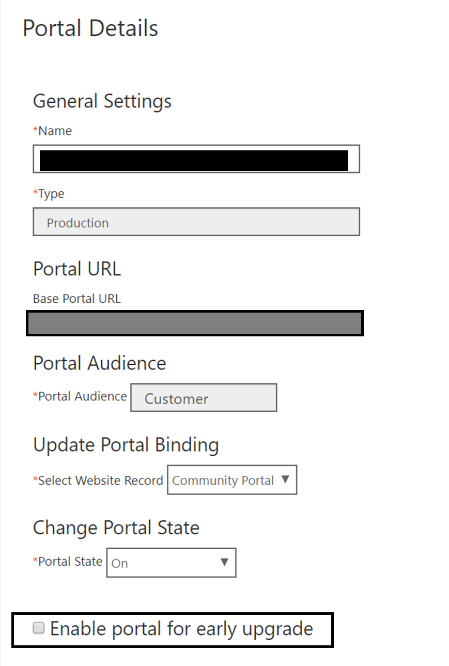 Monthly Release: Portal Solution component is not refreshed as part of every monthly release. It is typically refreshed once every two monthly releases. Major Release: Solutions are refreshed as part of every Major release. Updated by customers themselves using the Dynamics 365 Online Admin center. Portal website host is the Portal code which forms the actual website. Portal website host is updated automatically for all portals and there is no action required by customer to get the update. One of the important things to understand here is that any new version of Portal website host is back compatible with all supported versions of Portal Solutions. However, once a solution version becomes unsupported* it is not certified to run with new version of Portal host. Note: As of July 2017, all shipped versions of Portal Solutions are supported, and all the customers will be given enough heads up to update to latest versions before any solution version is marked as deprecated. However, all customers are advised to update their solutions to latest versions as soon as possible to make sure they are always able to use all the new Portal functionality. As part of any Portal release, Portal website host are updated automatically to latest versions while Portal solutions are updated by customers. It is important to understand impact of each component update on your live Portal, so you can plan accordingly. If you are running a production version of Portal (it can be seen on Portal Admin center), there will not be any downtime to your live Portal when your Portal is updated. Our update process ensures that none of the customers using your Portals are impacted when any update is done. If you are running a trial version of Portals, there will be around 6-10 mins of downtime and you will not be able to access Portal. While Installing/updating any solution in your Dynamics 365 Instance, you can see some instability in your Dynamics 365 Instance. Portal Solution update process update solutions present in your Dynamics 365 instance and will impact your Dynamics 365 instance which will in turn have an impact of your Portal as well. Hence, it is always advised to do solution updates in your Dynamics 365 Instance during dark hours. In the end, I want to talk about how you will be notified about any release and can prepare for it. Every customer will be notified about new Portal release through Office 365 Message center (in Office 365 Admin center). Make sure you have either access to Office 365 message center (Global Admins and Dynamics 365 service admin will have access) or have discussed with your Global Administrator/Dynamics 365 service administrator to inform you about any new Portal release. Notifications are sent out in general around 2-5 business days ahead of the release. Notifications are sent out to only those customers whose portals are planned to be updated. Each notification will provide details of the type of update and the, date/time it will be rolled out along with the link to release notes, for example, https://support.microsoft.com/en-us/help/4034875/portal-capabilities-for-microsoft-dynamics-365-version-8-3-0-215-relea). How can I prepare for new releases? As part of 8.3 release of Portals, one of the major change brought in Portal release process was launch of early upgrade process for Portal releases. This process is aimed at give you enough time to prepare when any Portal release is expected to rolled out. As part of early upgrade process, for every release of Portals, we will be upgrading certain portals (which are enabled for early upgrade) early before rolling out the upgrade for all customers. This will give you an opportunity to enable your dev/test portals for early upgrade and test all core scenarios before the upgrade hit your live Portal. Early upgrades are rolled out at least one week before global rollout of any release. Also, notifications for early upgrades are sent out in the same manner as described above. You can enable/disable Enable portal for early upgrade option for any Portal anytime. However, we take a snapshot for all the Portals marked for early access two days before any release and any Portal marked for early access after that is not guaranteed to get early upgrade. You can report any issues spotted during early upgrade phase via standard support channels. If no easy workaround exists, we will fix the reported issues and roll out new versions which will go through same early upgrade process. Also, Microsoft Support team will be keeping you updated about the progress of your reported issues. This concludes all the details which I wanted to share regarding Portal update process. Hope you find it useful. In case you have any feedback, do not hesitate to share with me. Till then, Happy Portal’ing !! !